Myanmar or the Union of Myanmar, also known as Burma is located in South East Asia. The country has always been known locally as Myanmar but during the the time it was a British Colony the name Burma and Rangoon became established due to diffficulties pronouncing the local languange. Myanmar is situated along the latitude 10° N to about 28° 30 N. It is bordered by India and Bangladesh to the West, China to the North, Laos to the East and Thailand to the South East. In the South to South West the extends the the Andaman Sea and the Bay of Bengal . Myanmar has an area at 676,578 square kilometres (261,227 sq mi), comprising 14 administrative divisions. It is the world’s 40th largest country and the second largest in Southeast Asia. Its land borders are 5,876 kilometers (3,651 miles) and its coastline forms one third of Burma’s total perimeter, a length 1,930 kilometres (1,200 miles). Burma is a large country with a rugged landscape. There is a dry plain in the centre of the country which is ringed by steep, jungle covered mountain ranges. 49 per cent of the land is covered by forest and woodlands. Four of Asia’s largest rivers, the Irrawaddy, the Chindwin, the Sittang and the Salween, run through the country. The five main geographic divisions in the country are the Western Mountains, the Northern Mountains, the Shan Plateau in the east, the Central Basin and Lowlands, and the Coastal Strip. The Western Mountains, averaging 1,829 m (6,000 ft) in elevation, run in a north-south direction along Burma’s western border from the Northern Mountains to the coast. The upper half of the region, which includes the Patkai Range, Naga Hills, and Chin Hills, forms the border with India. The lower half of the Western Mountains, formed by the Arakan Mountain Range, runs along the Bay of Bengal. The Arakan Mountain Range, starting at the Chin Hills and running along the coastline to the Arakan (Rakhine) Peninsula, protect the central region from the southwestern monsoon rains, creating a semi-desert landscape called the Dry Zone. The Northern Mountains lie entirely within Kachin State in the northernmost reaches of Burma and form a boundary with China. Included in the range is the nation’s highest peak, Hkakabo Razi, at 5,881 m (19,295 ft). Some of Asia’s most significant rivers originate in the Northern Mountains including the Irrawaddy, the Salween, Mekong, and China’s Yangtze. Steep gorges cut by these major rivers characterize the region which is home to some of the major mineral sources including jade and other precious metals that are mined in the region. Subtropical vegetation and terraced rice paddies line the region’s deep valleys. Occupying the eastern Shan State, this plateau ranges between 750 m (2,461 ft) and 1,200 m (3,937 ft) in elevation. The area is filled with deep valleys and gorges cut by rivers that flow through the region. The plateau originates in China, extends west to the Sittang River and merges in the north with Burma’s Northern Mountains. To the south, it joins with the Dawna Range and the Tenasserim Mountains of Burma’s Malay Peninsula. The regional climate is tropical with three seasons: a humid dry season (March through May); a wet season (June through September); and the cool season (October through February). Extending from the Northern Mountains to the delta region, between the Arakan Mountain Range and the Shan Plateau, is the Central Basin and Lowlands. This area’s fertile valleys are formed by the rich alluvial deposits of the Irrawaddy and Sittang Rivers. The Bago Mountains separate the Irrawaddy Valley and the Sittang Valley. The delta area is uniformly flat, never reaching an elevation of more than 18 m (59 ft). A line of extinct volcanic peaks, located in the basin, includes the largest of the eroded volcanic cones, Popa Hill (1,518 m/4,9801 ft). The region includes three major hydrocarbon basins along with Burma’s major oil fields. Burma has an extensive coast bounded by a multitude of islands. The upper half of the coast, the Arakan Coastal Plain, lies between the Bay of Bengal to the west and the Arakan Mountain Range to the east. This alluvial coast boasts rich farmland. The coast winds east to the Irrawaddy and Sittang deltas. South of the deltas is Burma’s lower coast, the Tenasserim Coastal Plain. This narrow strip of land, ranging from 48 km (30 mi) to 90 km (56 mi) in width, forms part of the border with Thailand on the Malay Peninsula. The coast is bordered by the Andaman Sea to the west and the Tenasserim Mountains to the east. The Chindwin rises in the far north, near the border with India and flows southwest for 840 km (522 mi). The upper part dissects successive mountain ranges covered in jungle. The lower reaches of the river can span several miles in width yet may have an average depth of only three feet during the dry season. During the rainy season (June to November), the Chindwin is navigable for more than 644 km (400 mi) upstream. It ultimately joins the Irrawaddy above Pagan. The Irrawaddy covers a distance of 2,170 km (1,350 mi) and flows entirely within Burma. Navigable for the majority of its length, it is the country’s most important transportation artery. It follows a southerly route from its headwaters in the northern mountains. After it is joined by the Chindwin, its primary tributary, the Irrawaddy widens to as much as 6.5 km (4 mi). The Irrawaddy Delta begins about 225 km (140 mi) inland where the river branches into many tributaries. These tributaries carry mountain silt deposits, which fertilize one of the richest rice producing areas in the world. The river ultimately empties into the Andaman Sea. The 418 km (260 mi) long Sittang River flows from the western edge of the Shan Plateau to the Gulf of Martaban. Its basin is geographically cut off from the Irrawaddy by a mountain range. The river is not navigable because of a strong tidal bore and swift currents, although it is used to float timber downriver. The Sittang does not carry as much silt as the Irrawaddy and its basin, which drains Burma’s eastern districts, is considerably less fertile. Burma is rich in natural resources including oil and gas. High quality gems such as rubies and jade are also mined. The country’s main industries are agriculture, forestry (Burma is the world’s largest exporter of teak), metals, and textiles. Myanmar has a population of 60.28 million (2010 census estimates) making it the world’s 24th most populous country. Of this 75% of the population lives in the central lowlands. Until recently the capital city was Yangon (known as Rangoon from the time of British Colonial Administration until 1989). Yangon is situated in the south where the Yangon and Bago Rivers meet. 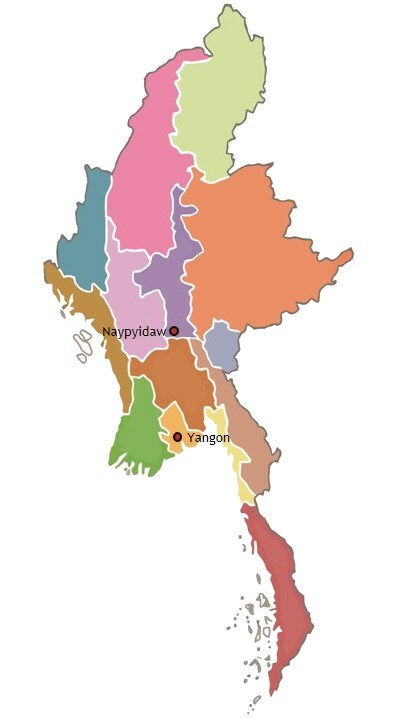 In March 2006 the political capital was relocated inland to the newly established city of Nay Pyi Daw. Myanmar sits in the monsoon belt, but its climate and rainfall varies considerably because of topographic features. The Tropic of Cancer divides Burma into two climatic zones. The southern two-thirds of the nation is largely tropical while the northern third is sub-tropical with a more temperate climate. In the tropical monson zone with three main seasons: monsoon, cool and hot. The hot and humid period is between February and May, with very little rain. The temperatures in this period are usually higher than 38°C. The rainy season runs from May through to October. The temperatures during this season are more moderate, ranging from 24°C to 32°C. During the monsoons, it can rain up to 200 inches (5,000 mm) of rain to coastal regions each summer. The “dry zone” of interior Burma still receives up to 40 inches (1,000 mm) of precipitation per year. Dry, cooler weather prevails from October to February with temperatures between 15°C and 32°C. The official language of Myanmar is Burmese, a Sino-Tibetan language. Approximately 80 per cent of the population can speak Burmese. In addition, each of the 135 ethnic groups has their own language and dialect, and Burmese may be spoken as a second language. Myanmar is listed has having 117 known languages. But one is classed as extinct and show 22 others are in danger of becoming extinct. For more information http://www.ethnologue.com/country/MM/languages has the full list. The Burmese population is ethnically complex and is composed of approximately 135 ethnic groups and sub-groups, each with its own dialect, beliefs and customs. These are grouped into eight “major national ethnic races”. This grouping is primarily according to region rather than linguistic or ethnic affiliation. Kachin, Kayah, Kayin, Chin, Mon, Bamar, Rakhine and Shan. Kachin State is the land of mountain ranges where the May Hka and the Mali Hka rivers are born. It is located in the north and north-east of Myanmar between 23o 38’N and 28o 31’N latitudes and 95o 48’E and 98o 47’E longitudes. Yangon Region has the main port Yangon. The City lies where 16o 19’N latitude intersects 96o 52’E longitude. Yangon Region is located at the eastern extremity of the Ayeyarwaddy Delta area with Andaman Sea on the south-east. Kayah State– Mateku Falls and Lawpita Falls on Balu Chaung are scenic beauties of Kayah State, which has a generally hilly topography. It is located between 18o 29’N and 19o 58’N latitudes, 96o 50’E and 97o 52’E longitudes. Mandalay Region falls in the Dry Zone of Central Mandalay bordering Bago Region on the south, Magway Region on the west, Sagaing Region on the north and Shan State on the east. Its area is 14,295 square miles. Kayin State lies between 15o 12’N and 19o 28’N latitudes and 96o 23’E and 98o 56’E longitudes on the east of Myanmar. It has common borders with Mandalay Division and Shan State on the north. Ayeyarwaddy Region covers the deltaic coast of the Ayeyarwaddy River. on the northwest and west of this division are the Bay of Bengal and Rakhine State, on the north and east is Bago Division, on the east is the Yangon Division, and on the south is the Andaman Sea. Chin State is located in the north-west of Myanmar between 20o 40 ‘N and 24o 06’N latitudes and 92o 37’E and 94o 09’E longitudes. To the north and east of Chin State is Sagaing Division, to the south are Magway Division and Rakhine State, Sagaing Region is situated in the north-west of Myanmar between Chin State on the west, Kachin State on the north-east, Shan State on the east and Magway Region and Mandalay Region on the south. Mon State is located between 14o 52’N and 17o 44’N latitudes and 96o 53’E and 98o 13’E longitudes bounded on the north by Bago Division, on the east Kayin State, on the south by Tanintharyi Division and on the west by the Gulf of Martaban. Magway Region falls in the Dry Zone of Central Myanmar, bordering Mandalay Region on the east, Sagaing Region on the north, Chin State and Rakhine State on the west and Bago Region on the south. 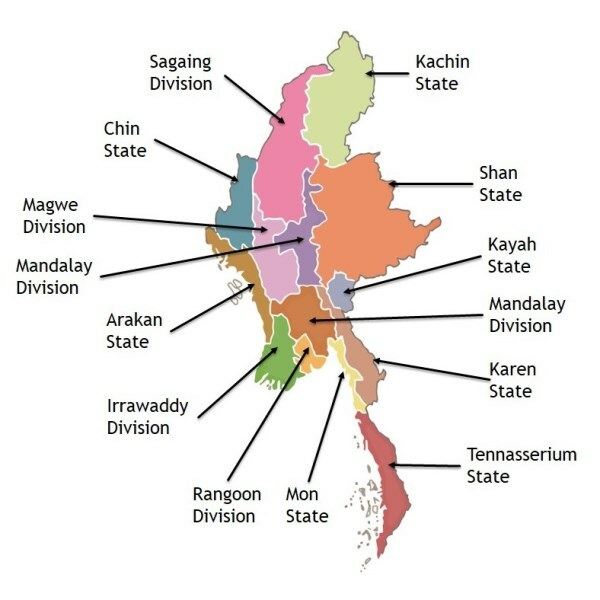 Rakhine State is located between 17o 21’N and 21o 24 ‘N latitudes and 92o 10 ‘E and 94o 54 ‘E longitudes bordering Bangladesh on the north-west, Chin State on the north, Magway Division, Bago Division and Ayeyarwaddy Division on the east and the Bay of Bengal on the west and south. Bago Region is located between Mandalay Region and Magwe Region in the north, Rakhine State and Ayeyarwaddy Region in the west, Yangon Region in the south, Kayin State and Mon State on the east. Shan State is located in the Middle Eastern part of Myanmar between 19o 17’N and 24o 13’N latitudes and 96o 10’E and 101o 11’E longitudes. It is bounded on the northeast by the People’s Republic of China, on the southeast and south by Laos and Thailand, on the north by Kachin State, Sagaing and Karen State on the south. Tanintharyi Region lies at the southern end of Myanmar. The Region has common borders with Thailand on the east and south-east, Mon State on the north, and Andaman Sea on the west. The area of the Region is 16,735 square miles. The average family has two or three children and traditinal family may have up to 3 generations living in the same house. In Burmese culture first cousins are typically thought of as brothers and sisters. Children are under the guardianship, protection and control of their parents. Children are expected to be dutiful and obedient, helping in the home. There is an expectation that children will care for their parents in old age. Traditions and religious beliefs have an impact on roles within the family. Naming conventions in Burma are very different from those in Western culture. Traditionally, people’s names are not divided into ‘first’ and ‘last’ but rather form a whole. In some cases a person may have only one name. Traditionally, women have enjoyed a high social and economic status and have had similar rights to men. Women keep their names after marriage and usually manage the family finances. They work alongside men on family farms and in small businesses. Traditional Burmese dress varies somewhat from one ethnic group to another. Within an ethnic group there are differences of design, colour and fabric. Burmese women weave colourful designs into fabric which is used to create their traditional sarongs and tunic style tops. The sarongs for men are called ‘pasoe’ and sarongs worn by women are called ‘htamain’. Buddhism (Theravada) is the main religion, practiced by 89 per cent of the population, and has a direct impact on all aspects of daily life including family. Christianity is practiced by four per cent of the people (Baptist three per cent, Roman Catholic one per cent), Islam by four per cent and the remaining three per cent practice Hinduism or animism. Buddhism emphasises compassion, equality and wisdom, and requires worship, meditation, charity, pilgrimages, sponsoring the building of a pagoda or becoming a monk. Most boys in Burma are expected to spend some time in a monastery during their youth.